Today's Nice Price or Crack Pipe contender is a one-off Toyota called an Opendeck that's like an Avalanche for Lilliputians. It's super rare, but you'll need to decide whether or not its price is totally the poop deck. Well, while we were all Saab-knobing with yesterday's 2003 9-3 Arc and its fancy gearbox fully of gear selections it seemingly managed to pull off an impressive 82% Nice Price win. You'd think that with such an impressive bonafide that its parent company would still manage to be in business, but sadly no. You can wipe away that tear for Saab - or stop having it permanently tattooed on your cheek - because the company is poised for a rebirth - thanks apparently to the Indians. It's not the South-East Asians but the Japanese that you can thank for today's contender - a claimed one-in-the-U.S. 2001 Toyota bB Opendeck. Now, it's a fact that the Japanese are - on the whole - a bunch of wild and crazy guys. That is indisputable. After all, they gave us Machine Gun Girl; the awesome practice of "inemuri" or sleeping on the job; and food that you don't even freaking have to wait around to be cooked! Wacky, I know! Seemingly just as zany is the bB Opendeck which, while sounding like a sexual position requiring sunscreen, is in fact an open-back car-based trucklet. It's sort of like a Subaru Baja or Chevy Avalanche, only charm bracelet small. We got the wagon version of the bB as one of the first offerings of Toyota's brand for Gen-Ex'ers, the Scion xB. Not much was changed from b to x, but as is obvious from this car, some of the crazy was left at home. Well, good news United Staters, it's here now, and not just in toy form. The Opendeck isn't just an xB with the back cut off like all those Redbull Minis that are just so 2004. 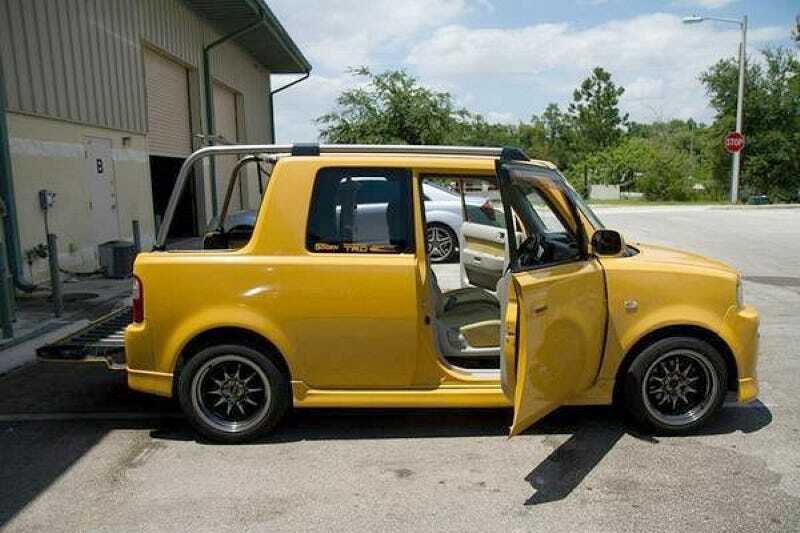 There is also a Honda Element-like door arrangement offering B-pillarless egress to its bizarro world backwards interior on one side. Inside, which looks to be in fine shape - you'll find seats that fold and bow and probably transform into giant robot kitties for all I know. Out in back there's a tiny load area and a clamshell hatch to extend the outside in. Stainless tubes also define what would traditionally have been the bB's outline. Up front, it's traditional bB so nothing to get excited about. Toyota only built 900 Opendecks before they came to their senses and switched over their production line to the making of beige, four-cylinder Camrys. I think that before that happened all the Opendecks came with a 1.5-litre four and automatic transmission. This one is a column-shift so I'd say it's safe to say that's what's here. This one's also here - and by here I mean in the U.S.. It is additionally claimed to have a clean title and surprisingly that's not from the wacky state of Florida. The car is actually being offered in of all places, Bean Town. Now, I don't know about you but when I think zany towns, Boston doesn't spring immediately to mind. What needs to come immediately to your mind is whether or not this wacky Toy - supposedly the only one already in the U.S. - is worth its seller's $15,999 asking price. What do you think, is this Opendeck worth opening your wallet to the tune of almost sixteen grand? Or, is this a case of never stick your check into crazy? Mighty, Mighty Boston Craigslist, or go here if the ad disappears. H/T to jkm7680 for the hookup!